The same day, UKIP came just 617 votes behind Labour in the Heywood and Middleton byelection in the Greater Manchester area – formerly a safe Labour seat. Carswell, the sitting MP who defected from the Conservatives then resigned to prompt the byelection, romped home with 21,113 votes. He trounced his Tory opponent, Giles Watling, who scored 8,709. Labour came third with 3,959, its share of the vote down from 25% in 2010 to just 11.2% after only a token campaign. The Liberal Democrats trailed in with a humiliating 483 votes. UKIP won almost 60% of the vote. Its leader Nigel Farage told BBC Breakfast this morning that UKIP had “shaken up British politics” and “could hold the balance of power” after next year’s general election. More serious for the left is that UKIP’s victory in Clacton, and its success in the European parliamentary elections in May, will result in the three mainstream parties adopting more right wing policies and pandering to the racists’ agenda. In the wake of the Clacton victory one of the first things UKIP HQ did was to write to the BBC demanding the right to take part in the leaders’ television debates in next year’s general election. This result has been on the cards – the last two years of local authority elections have seen UKIP pick up hundreds of seats. It triumphed in the May European Parliament poll, coming first with 27.5% of the vote. And it has been steadily improving its performance in parliamentary byelections – the hardest to win under Britain’s first past the post electoral system. Another byelection is coming in Rochester and Strood, Kent, where another Tory MP, Mark Reckless, has defected to UKIP and stood down to fight a byelection just as Carswell did. Heywood and Middleton feels like more of a disaster than Clacton, where Carswell – as the incumbent until his party switch and resignation – was expected to win. Although Labour held the seat, it has gone from safe Labour stronghold to absolutely marginal. UKIP, just 617 votes short will have Heywood in its sights next May. What has happened in Heywood? The Labour vote held up – in percentage terms, going from 40.1% in 2010 to 40.9% yesterday. But this conceals a huge stayaway by Labour voters. Turnout was well down, from 57.5% to just 36%. Some dip might have been expected in a byelection – but this was a high-profile byelection, with Labour throwing its frontbench big hitters into the campaign. In real terms, Labour’s vote has fallen from 18,499 to just 11,633. Nearly 7,000 people who could have been expected to show up for Labour did not do so. The failure of mobilisation is not because Labour did not campaign in the constituency – all the big guns were there – but because its politics of tailending the Tories offer nothing worth getting out of bed for. We saw in Scotland’s referendum how Labour suffered as Miliband stood shoulder to shoulder with Cameron and Clegg. Working class people deserted the Better Together campaign in droves, turning instead to a Yes campaign that articulated their aspirations for a better future. Again and again we see the same thing: Tories say austerity, Labour says it too. Cameron wants to bomb Iraq, Miliband agrees. Labour’s failure to stand up for ordinary working class people who cannot feel the end of the recession is no more attractive in England than north of the border. But Miliband’s Labour seems to be sleepwalking as the level of disillusionment with its policies rises so high it risks mass-scale abandonment by its traditional voters. In its complacency it was blindsided by the Heywood result. On Monday the Tory pollster Lord Ashcroft, published his polling predictions for Heywood. Labour are on course for a comfortable victory in this week’s Heywood and Middleton byelection. In a poll completed at the weekend I found the party on 47%, 19 points ahead of UKIP on 28%, with the Conservatives in third place on 16%. Both UKIP and Labour accepted these findings. Meanwhile, just shy of 5,000 people dragged themselves out to vote for the parties of the Tory-Lib Dem coalition. The two parties’ votes collapsed into UKIP in Heywood. Where there was a mainstream centre-right, now a far right racist party is the main rival to Labour. UKIP will also have made sure to scoop up the votes previously taken by the fascist British National Party – 7% in the constituency in 2010. Labour’s failure to sufficiently appeal to its voters to get them out means UKIP has this seat and many others in traditional Labour areas more firmly on its target list now. In May, a vote for UKIP in these seats will not seem a wasted protest vote, but a viable means of unseating MPs from the discredited purveyors of austerity from all the main parties, Labour included. This is the disaster of Heywood. For some years it has been clear that the traditional loyalty of the working class voters to Labour has been breaking down – a response to Labour’s many betrayals. That has not yet been shown in a general election, but now UKIP may have the momentum to break up the old certainties for good. There is no reason to complacently assume that if turnout in Heywood goes up in May, all the Labour voters will come flooding back. It is just as possible that seeing UKIP only 600 or so votes away convinces them that this party – in reality a foul, racist anti-working class party of the rich – could carry their message of discontent to Westminster. The Clacton and Heywood results together – one in a formerly safe Tory seat, the other in previously safe Labour territory – show how UKIP’s strategy is working out in different areas. Before Clacton, UKIP was hoping to win six seats at the general election in May 2015. The areas it is doing well run down the east coast of England from Great Grimsby in the north down through Norfolk, Essex, Kent and along the south coast. A key group inside UKIP, most notably deputy leader Paul Nuttall, believes UKIP can do well in Yorkshire and Lancashire. It is worth noting that in both Yorks and Lancs, the fascist British National Party – now collapsed – had its electoral base. The English Defence League’s fascist and racist street thugs focused on these areas in their turn. YouGov published a poll in February 2014 asking more than 4,000 UKIP supporters how they had voted in the 2010 general election. Polls conducted by the BBC and Lord Ashcroft produced similar findings. The surveys are useful because they give us some idea about UKIP’s electoral strategy. Clearly the core of UKIP’s vote comes from disgruntled Tories. But that is not the end of the matter. Central to UKIP’s election message will be opposition to immigration and to membership of the EU. In this way, it hopes to capture Tory support. But it will have three other prongs to its attack. The first target audience will be former Lib Dem supporters, who have ditched the party in droves since its suicidal coalition with the Tories. I would think we have probably taken a third of the BNP vote directly from them, I don’t think anyone has done more, apart from Nick Griffin on Question Time, to damage the BNP than UKIP and I am quite proud of that. Nationally the BNP has recently been polling just 1% of the vote. But that isn’t the whole story: in some areas of Yorkshire and Lancashire its support can reach 7%. In a close-run election this could make all the difference between UKIP winning and losing. Given the BNP’s implosion, we should expect more racist overtures from UKIP to BNP supporters. The YouGov poll was conducted last February – that now seems a long time ago – but even then 11% of UKIP voters reported that they had voted Labour in 2010. Two more recent polls claim that this figure is now even higher, at 12%-15%. This means UKIP is going to chase working class votes with a combination of anti-establishment populism and base racism. Michael Crick’s Channel 4 News blog post, written in the run-up to yesterday’s byelections, made interesting reading. He argued that Labour has decided not to run a serious campaign in the Rochester and Strood byelection, and instead will run only a token effort, just as it did in Newark and Clacton. This says so much about the state of the Labour Party leadership and the weaknesses of Ed Miliband. The strategy is wrong in so many ways. It shows the Labour Party has no ambition and is simply concentrating on winning its core vote. Polling figures statistics show that in Rochester there will be a three-way split in the vote between UKIP, the Tories and Labour. Of course it will be very difficult for Labour to win – but it could just about do so. But this strategy means there will not be a serious campaign challenging the Tories or UKIP. It is dangerous to leave UKIP largely unopposed, because for UKIP to make a breakthrough at the general election, it has to keep winning. Successes will give UKIP campaign impetus, electoral ‘credibility’ and will result in more Tory defections. Byelection defeats will push UKIP back. There is another danger too: the response of both Labour and Tories to UKIP’s gains so far has been to adapt to its racist, bigoted, immigrant-bashing agenda. It seems horribly likely that the run-up to the general election will see UKIP drag mainstream politics further to the racist right. It is to the eternal shame of Labour that it too has made concessions to this divisive racism. Rochester is going to be a major test. If the Tories lose, there are likely to be more defections to UKIP and it will give UKIP the crucial momentum it needs as the general election approaches. Miliband’s Labour is highly unlikely to suddenly reconstitute itself as a champion of the working class. A real challenge to Tory austerity, poverty and cuts is sorely needed. But on Thursday, the bad news was not limited to the results at the ballot box. The election of Britain’s first UKIP MP and the horribly close result in Heywood came on the same day that Tuesday’s planned strike by around a million local government workers was called off. The leaders of the local government unions, all tied closely to Labour, have pulled the plug on action so close to the general election, instead recommending what looks a very poor deal. A planned tube strike was called off too. Just at the moment when workers need hope, the fightback has been scuppered – leaving all those who had worked and organised and recruited new union members high and dry, just days before the strike date. We really need more of a challenge to austerity, whether in the workplace, on the streets or at the ballot box – not less. The lack of a fightback and the feebleness of Labour’s politics – and its refusal to stand up against UKIP’s anti-immigrant rhetoric – are not only a danger in Heywood and Middleton, but in a slew of traditionally Labour towns. 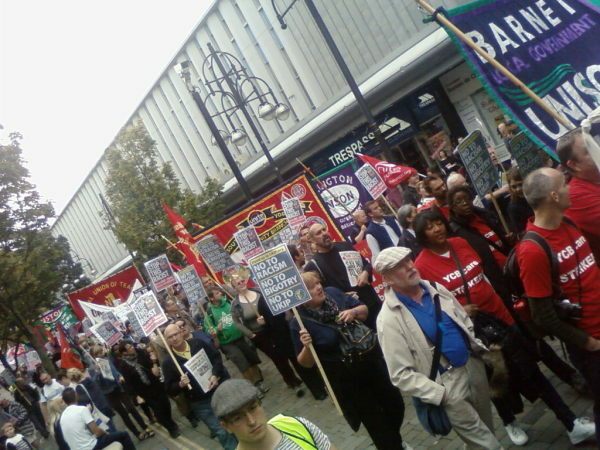 In September, around 1,000 people marched through Doncaster on the Stand Up to UKIP demo against UKIP’s conference, which was being held in the town. It was a good lively, noisy demo and those who marched were rightly proud to do so. 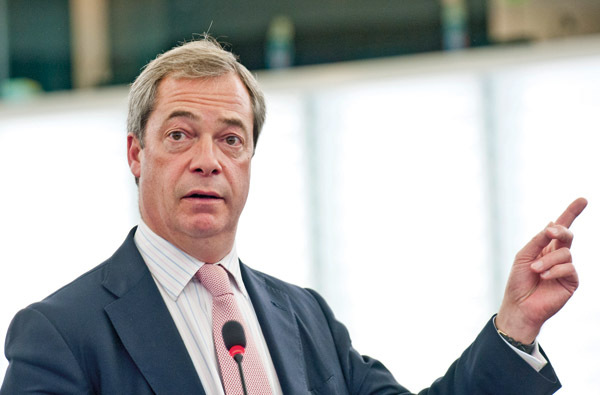 “Farage tells racist lies – Margaret Thatcher in disguise,” was the best of the chants, summing up in a pithy phrase the two most important points to emphasise about UKIP. It is an anti-working class party that loves the rich and – an argument that must not be ducked – it is building its base on racism and bigotry, scapegoating immigrants in particular. But this was the first time anyone has ever marched against UKIP – even street stalls and leafleting against UKIP are still new, with small groups of antiracists in local areas starting from scratch. The idea of systematically taking on UKIP and countering its arguments on the streets and doorsteps is just starting to be put into practice. And that was apparent on the march through the town, long blighted by the closure of the coal mines in the surrounding pit villages. Doncaster used to be a staunchly Labour area, a proud bastion of the organised working class that was a centre of the most militant miners in the Great Strike of 1984-85. But after the Tories smashed up the mining industry and devastated towns like Doncaster, Labour – which had failed to fight Thatcher – failed to deliver anything under Blair to restore the devastated South Yorkshire mining areas either. By 2009, Doncaster had a mayor from the far right English Democrats, former UKIP member Peter Davies. Davies got the boot in 2013, but the sense of bitterness and betrayal remains. If you want an example of how little Ed Miliband’s Labour Party has done to stop the Tories’ vicious austerity regime ravaging ordinary people’s lives, you don’t have to look much further than the MP for Doncaster North – Ed Miliband. In the May local elections, UKIP came a close second to Labour in ward after ward after ward. Two UKIP councillors were elected, although Labour, with 48, still holds the majority of the 64 council seats. So the Stand Up to UKIP demo was not one of those triumphant parades through cheering crowds. As it progressed through the main streets of the town, a small organised group of fascists from the English Defence League heckled and hurled abuse. And there was a mixed reaction to the march from the local shoppers who stopped to watch – some hostility, and a fair amount of wary puzzlement alongside some muted support. That’s not surprising – this is the start of a campaign, not the end point. You wouldn’t expect to have won the argument before you have even begun. But it was an illustration of how deeply UKIP has dug itself into some areas where really the racist Thatcherites should not be getting a hearing. The cuckoo is in the nest. That is something we can see in the Heywood result too. It was important that the demo was led off by striking Doncaster and Barnet care workers, that it was chock full of union flags and banners, and that well known local NUM leader Dave Douglass spoke at the start. The message that working people should not be used by UKIP is carried better when there are seven Unison banners, three from trades councils, three from the NUT, one from the NUJ, three from Unite, one from NAPO and three from the UCU, along with flags from the bakers’ BFAWU, the GMB, CWU, UCATT and Unite. Many of the banners were from Doncaster and other parts of South Yorkshire. It was important too that there were banners from LGBT groups, while local black and Asian people marched proudly, many with great home made placards. But the grim byelection results bring home again how far UKIP has come, and that socialists and anti-racists can’t afford to duck the arguments. UKIP’s stockbrokers and public schoolboys are not just targeting the better-off types in the leafy Tory shires – they want our people too. And as we can see with the growth of racist populism – along with outright fascist parties – across Europe, UKIP is not merely a party of purple clowns. It is a real threat. What a sad day, but you can see it happening again. The number of anti- immigration among generally very sensible and caring people, who are probably tory voters, whom I meet is amazing. Amazing that is if you ignore the aggressive anti – immigrant slant of the media.